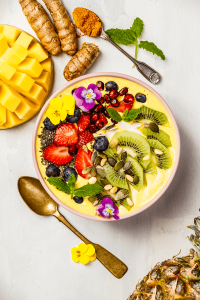 The Sattvic diet or the Yogic diet as it is more popularly known as in our modern times is made of foods AND principles that are meant to foster both a healthy body AND mind. Coupled with a regular yoga routine, it goes far beyond just helping a person lose weight. What Foods are Part of the Yogic Diet? Fresh fruits and vegetables, whole grains, legumes, dairy (in moderation), nuts and seeds, natural sweeteners (think honey and molasses), beans, spices, herbal tea, and plant-based oils are all included as part of the yogic diet. Whenever possible, choosing organic produce is highly encouraged. Keeping your diet natural and free from pesticides, chemicals, and stimulants that can only serve to harm the body is always the goal. Meat, along with any other food that requires harm to an animal, is purposely excluded from the yogic diet. More than just a way to improve one’s physical health, this diet is about a broader type of lifestyle. A lifestyle that puts its focus on serenity, peace, joy, and mindfulness. It is not enough to only nourish the body. The yogic diet is also about feeding the spirit. The atmosphere where meals are created needs to carry an ambiance of peace and love. It is believed that only in this type of surrounding can food absorb this special energy, later delivering it to the human body. Another point to take into consideration is your eating schedule. You may have rolled your eyes at your mother when she told you not to eat before going to bed but she knew what she was talking about. Give yourself at least two hours after eating to digest your food before hitting the sack. Hormones produced during sleep are meant to be used for things like repairing tissue and fighting infection. When we eat right before going to sleep, these hormones instead have to work to digest food instead of helping our bodies in the way they were meant to. It is worth noting that there are opposing viewpoints on whether it is detrimental to eat right before going to sleep. From a yogic diet standpoint, however, this practice is not encouraged. Almost all of us have encountered someone who was on a diet that was nothing short of pure torture. Perhaps they experienced deprivation or were required to perform a grueling exercise regime. Implementing yoga and the yogic diet and making it part of your lifestyle should be a joyous experience. It is about a journey of betterment, not of deprivation.